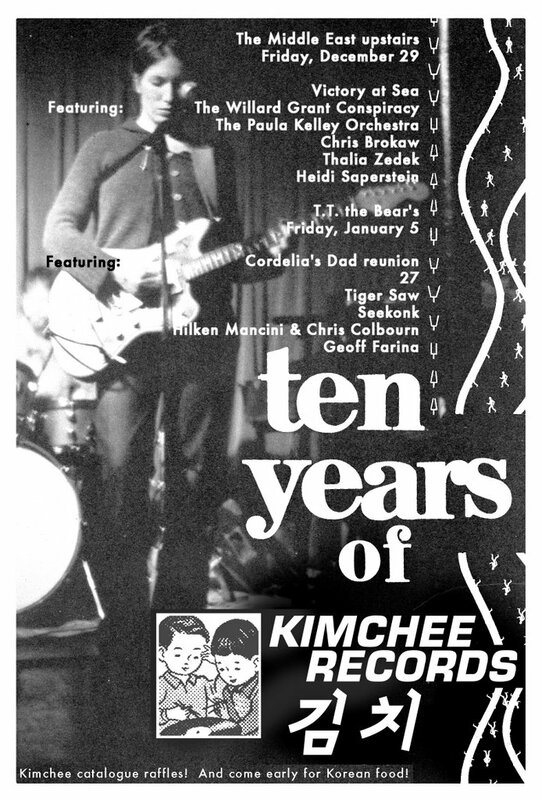 All hail Tim Bugbee, who took photos at the two Kimchee 10th Anniversary shows! Unfortunately he ran out of batteries right before the Thalia Zedek Band took to the stage, so we are missing documentation of that…and most Seekonk members were playing under the thin illumination of a blue 10 watt bulb, so those individuals are shorted as well. Here are just a few of them, but there is much more at the Kimchee MySpace Pic Page. 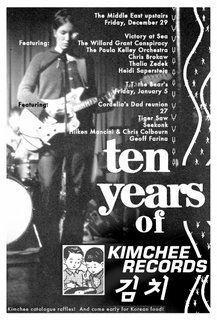 It takes a couple weeks for a middle-aged geezer like me to recover after attending two Kimchee 10th Anniversary Shows, both of which kept me and one of my main supporters, wife Danyelle, from bed until 3:00 am on consecutive Friday nights. Was it worth never-to-be- regained sleep hours? You betcha! First of all, the press was astounding and quite unexpected. 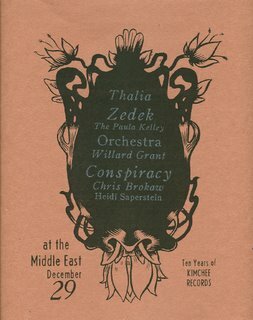 These included lengthy pre-show features in The Boston Globe (with 11 photos, one for each band! ), The Boston Herald, The Metro, and The Weekly Dig, as well as two prominent blurbs in The Boston Phoenix. Then there were even post-show write-ups in The Boston Globe and The Boston Phoenix, as well as one forthcoming in Northeast Performer magazine. So thanks are due to local scribes Jonathan Perry, Tom Kielty, Jeff Breeze, Michael Brodeur, Will Spitz, Linda Laban, Jim Sullivan, and Adam Arrigo. 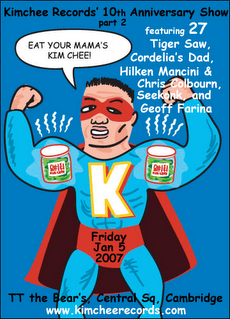 I’ll throw in Brett Milano as well, who has long been a Kimchee supporter in print. The whole night had a great flow to it, it felt really special, and the way each act contrasted with the next worked really well. Friday really felt magical. It seemed like everyone in the audience and in the bands were in a great mood , and ready to ROCK. 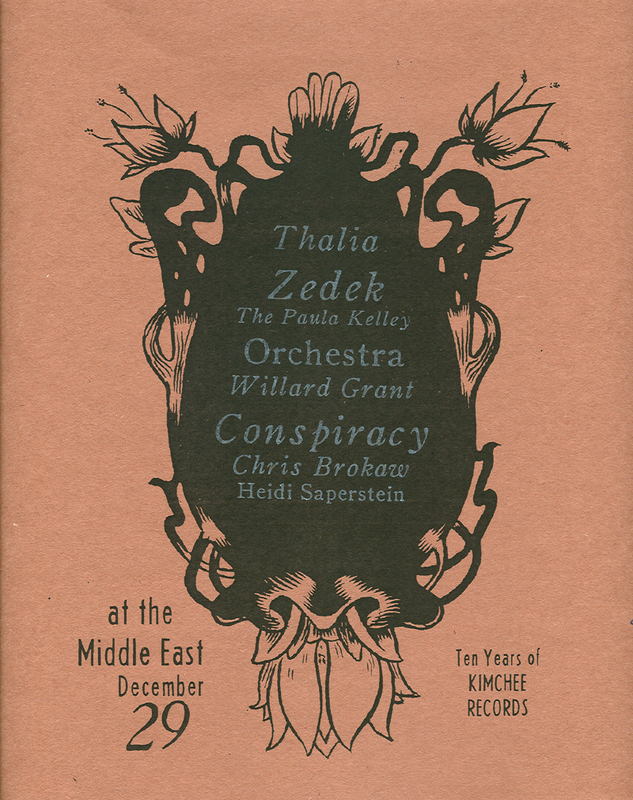 Paula Kelley mused further in a very swell way on her blog about that first show at the Middle East, which was a smidgen shy of a sellout. Thanks also to booking pros Kevin Hoskins and Randi Millman of the two clubs for hosting Kimchee on these two nights…and a really big hug and love to Kyung Ja Desjardins, Kimchee guy Bob’s mother-in-law, who spent many hours preparing the yummy Korean food treats avidly consumed during both shows. 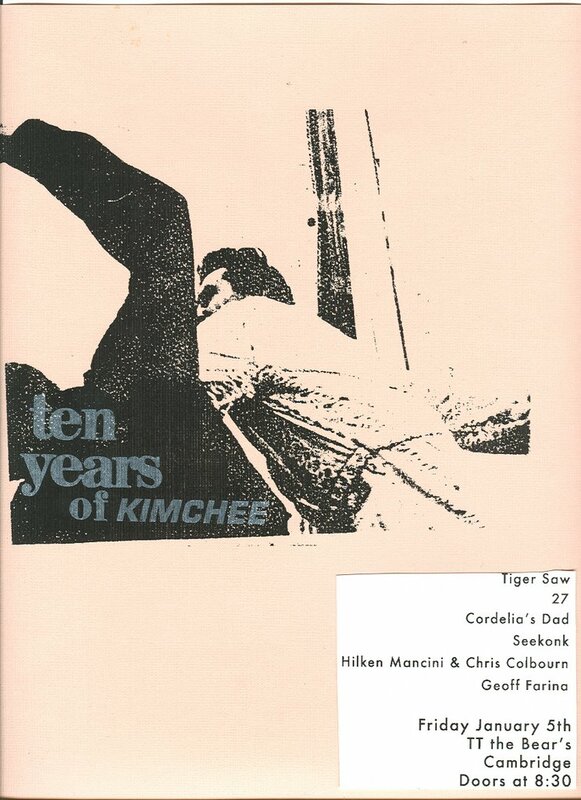 We’re still not sure what the future holds for Kimchee Records. But thanks to these shows and their embrace by music lovers in the Boston/Cambridge area, those involved with the label are feeling quite warm and fuzzy these days. Thanks so much to you all! You are currently browsing the Kimchee Records blog archives for January, 2007.